There are 20 reviews of Vanille Exquise. Yes, the name of the game is vanilla galore, but neither too heavy, top sweet nor cloying. Almond hints and a distinctly nutty undertone give it a mice twist, and a wood base, mainly gaïac, and a white musk note round it off. Not sensational, this is an elegant vanilla scent; the name is very appropriate. I think that Vanille Exquise is very well named: It is an beautiful rendition of vanilla – a slightly burnt version of a rich, mostly dry vanilla. “Sweetness” is not the keyword for this fragrance… “delicacy” would be the better description. It is certainly not a solo vanilla… it is quite well adorned with other light, delicate notes: I can clearly identify the almond; I willingly accept that there is benzoin partnering with the vanilla; there’s a believably probable white musk / sandalwood accord in the mixture; and, although I can’t specifically pick them out of the accord, I can believe that there is a touch angelica and gaïac providing even more lightness, airiness, and delicacy to the non-powdery vanilla accord. Vanille Exquise is a sophisticated fragrance… full, complex, and delicate. On my skin it has appropriately limited projection; and it has excellent longevity, especially as an exquisite skin scent. It's unfortunate for me that something about my skin keeps the woods or musk in this frag from developing. To me, it is a gourmand, and like another reviewer wrote, it consists of vanilla extract mixed with a bit of almond extract. It kills me that my individual chemistry doesn't allow the edge of benzoin or dryness of the woods to come forth. It's not a cheap generic vanilla, but on me it just doesn't work. This starts like a rich vanilla ice cream with a hint of coconut ice. It's a little too cloying for me at this stage. It dries to a woodier vanilla which I like very much, but it wears too close to the skin for me to be tempted to buy a full bottle. 1x ANNICK GOUTAL Vanille Exquise Eau De Toilette mini Spray Perfume, Brand NEW!! 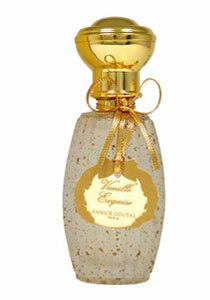 ANNICK GOUTAL Vanille Exquise Eau De Toilette mini Spray Perfume, Brand NEW!! There are no member images of Vanille Exquise yet. Why not be the first?